Begin your journey with us at NHI’s All Campus Open House on Thursday, August, 9th from 3 pm – 7 pm. Learn about NHI’s industry-recognized massage therapy training program and the exciting career opportunities in massage therapy. You can have a rewarding career as a Massage Therapist in under a year! By attending this event you will receive a $500 voucher towards your tuition if you start classes in August, September, or October. We are excited to meet you at our open house! Please feel free to bring your friends and family on this special day. Activities and offerings may vary depending on which campus you attend. 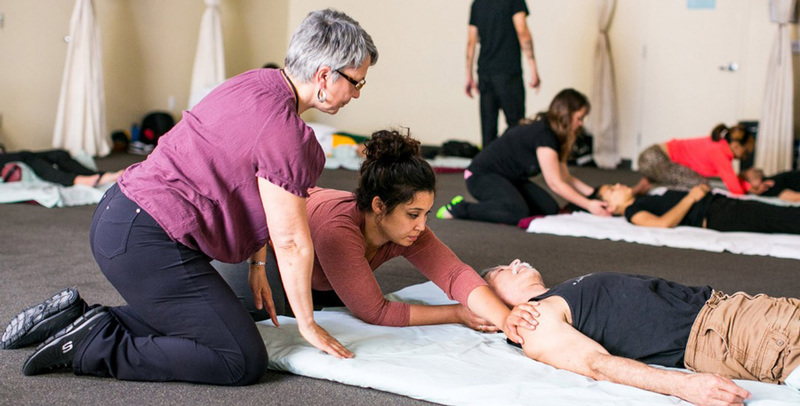 You will be able to see samples of our Eastern based classes including Shiatsu, Energy, and Thai Massage, or our Western-based classes including Aromatherapy, Swedish Massage, Deep Tissue Massage and Hot Stone Massage. During the open house, you will have the chance to meet with current students, graduates working in the field as Certified Massage Therapists, our expert team of massage therapy instructors, and employers who specifically seek out NHI graduates. Our friendly team of Admissions Representatives and Financial Aid Advisers will be present and prepared to answer your questions and provide you with the information you need to take the next step towards having work you love. While visiting the campus and classrooms you will experience NHI’s welcoming environment filled with positive energy and students like you seeking personal and professional fulfillment. You will get a feel for what it’s like to be part of the NHI community and see for yourself if NHI is the right fit for you. Perks may include… Chair Massage, Salt Scrubs, Aromatherapy & Refreshments! You’ll have the chance to enjoy an energizing and rejuvenating chair massage by one of our current students. A chair massage can work wonders for your body, your mental state and your sense of well-being and happiness. Exfoliate, invigorate, and regenerate your skin with a custom salt scrub. Salt scrubs can breathe new life into tired skin by improving circulation to give your skin a natural glow. Experience an aromatherapy treatment. Aromatherapy can be defined as the art and science of utilizing naturally extracted aromatic essences from plants to balance, harmonize and promote the health of body, mind, and spirit. Delicious refreshments will be provided for you to enjoy while touring around our beautiful campuses. RSVP now by clicking the campus-specific event link below! Don’t miss out, spaces are filling up fast!